For those that have hankered for more in the way Gungriffon gaming, then look no further. We now have a very competent homemade PC version called the HIGH-MACS Simulator that’s very much in-line with the original Saturn games. It's a Japanese game most of the menus are in English. Both the controls and handling are also refreshingly fluid too. The stage is a battlefield in the near future for this 3D shooting game. "HIGH-MACS simulator". Pilots belong to the Japan Foreign Legion, who man armored combat walking vehicles called HIGH-MACS. 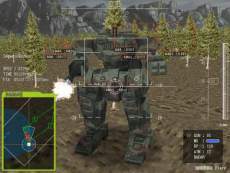 The player will train in combat for a variety of situations on the simulator. You can use 5 different weapons GUN (main gun), MG (machine gun), RP (rocket pod), ATM (anti-tank missiles), and RADAR (radar).